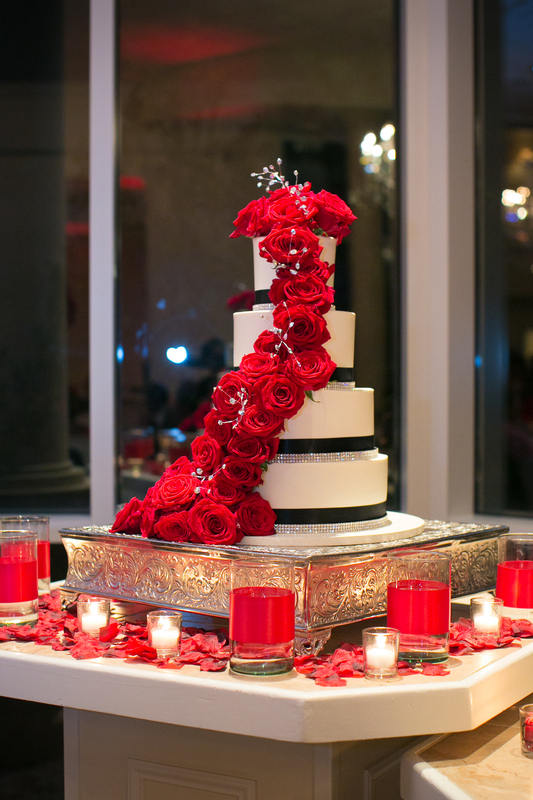 RED Roses, RED Roses~! 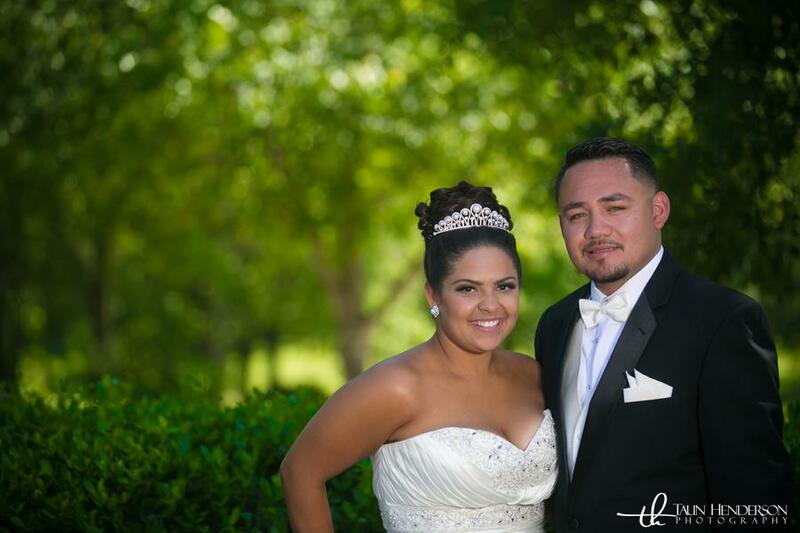 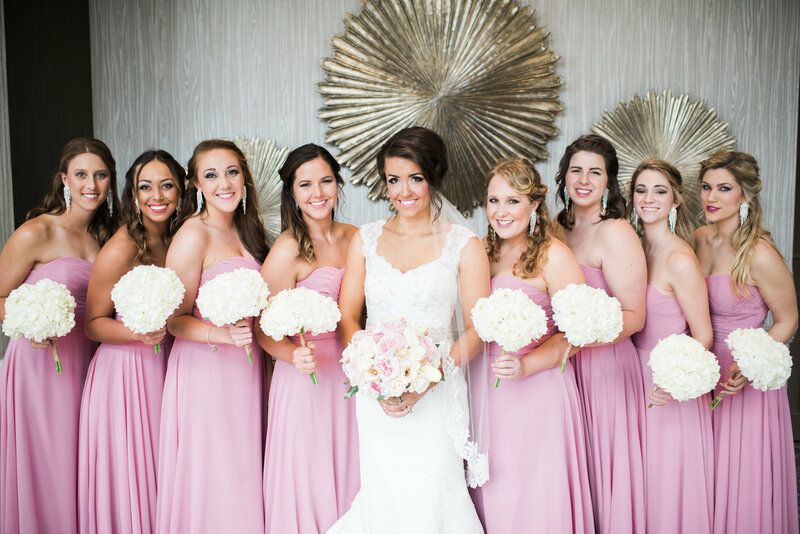 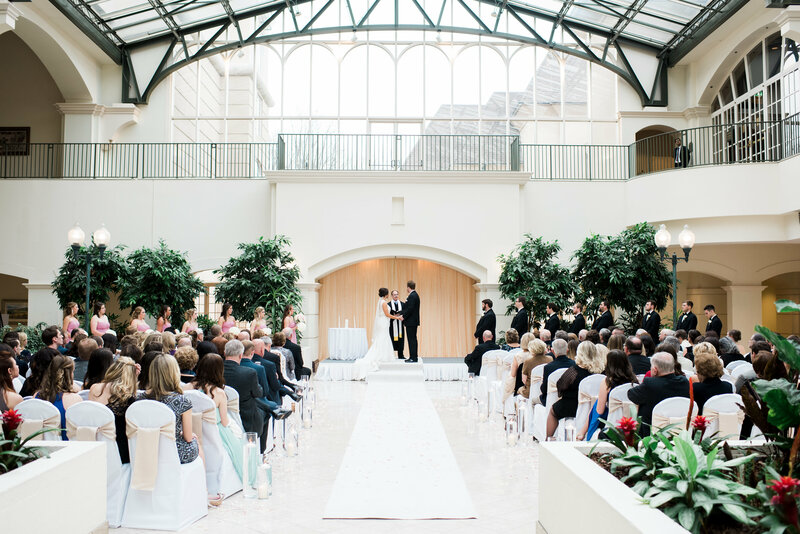 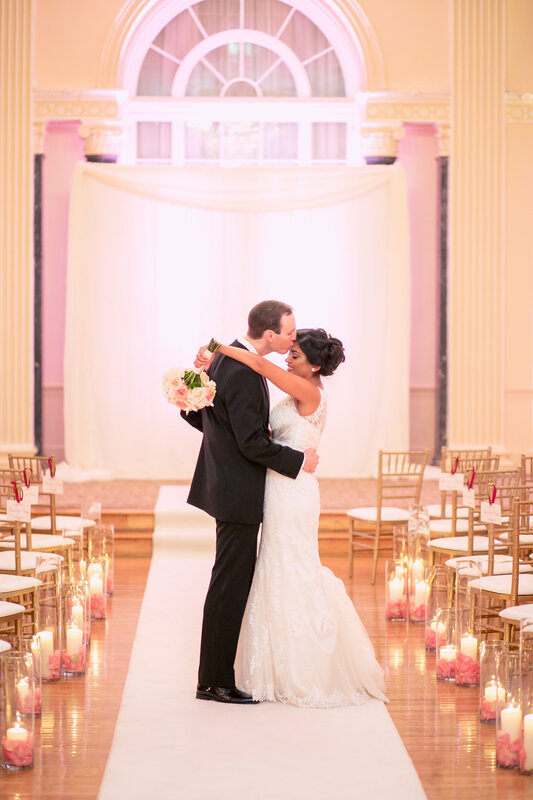 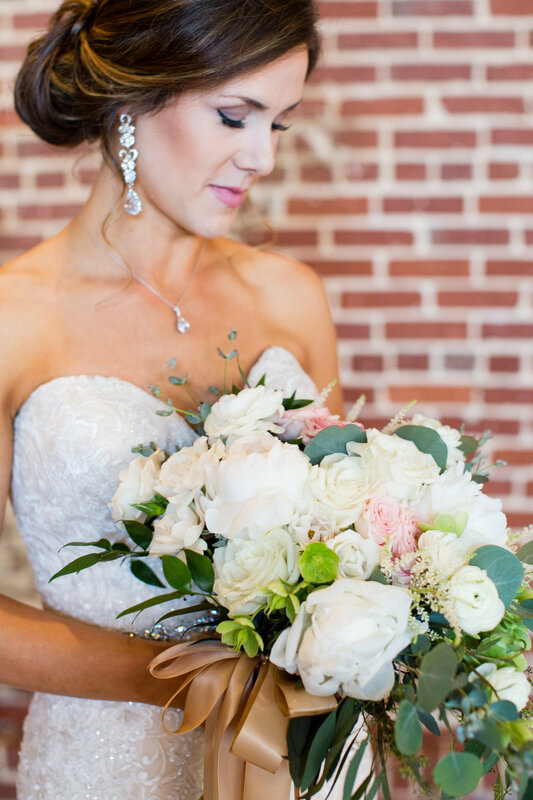 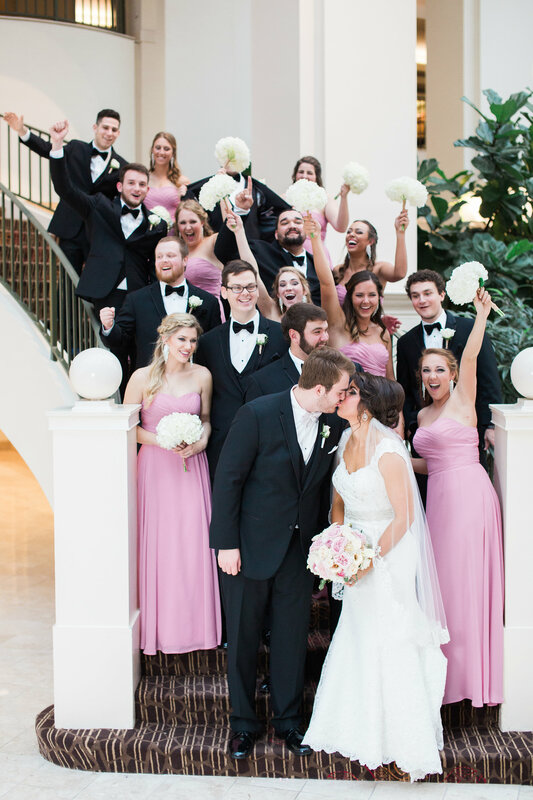 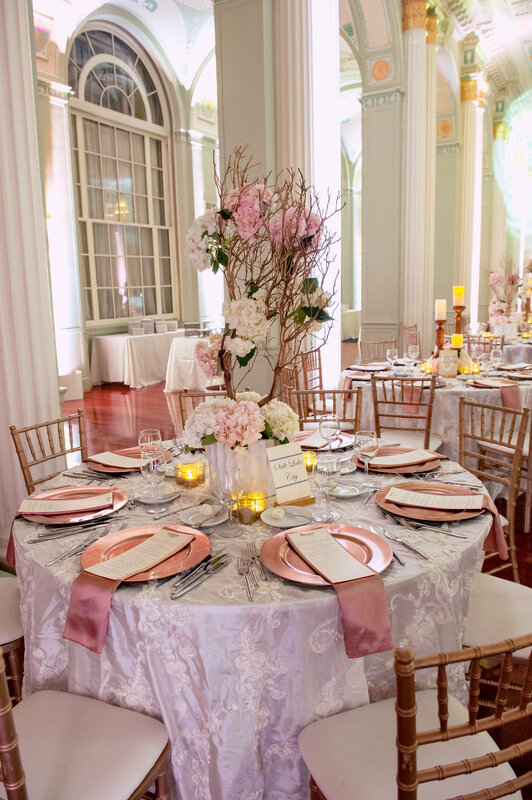 We love the colors of this gorgeous wedding at Ashton Gardens. 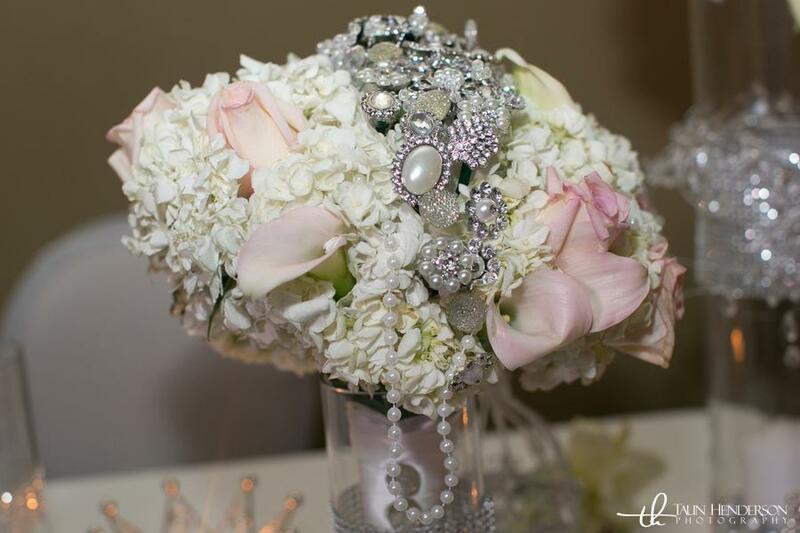 Tomesha was radiant carrying her elegant full bouquet of “Charlene” Red Roses and rhinestone ivory wrap. 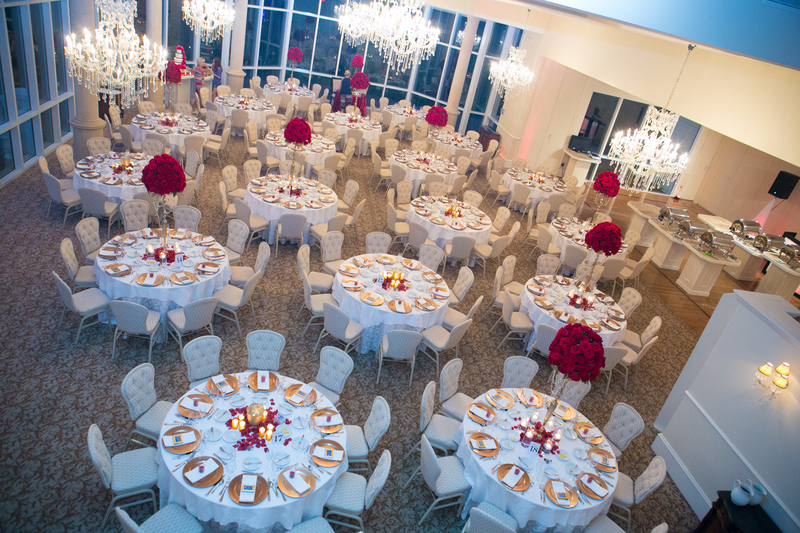 We designed this intimate ceremony with Luscious Red Rose arrangements with multiple Red Rose Flower Balls, and petals lining the aisles. 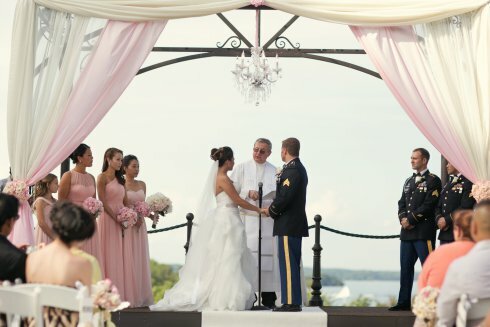 A wonderful wedding party and a very special couple. 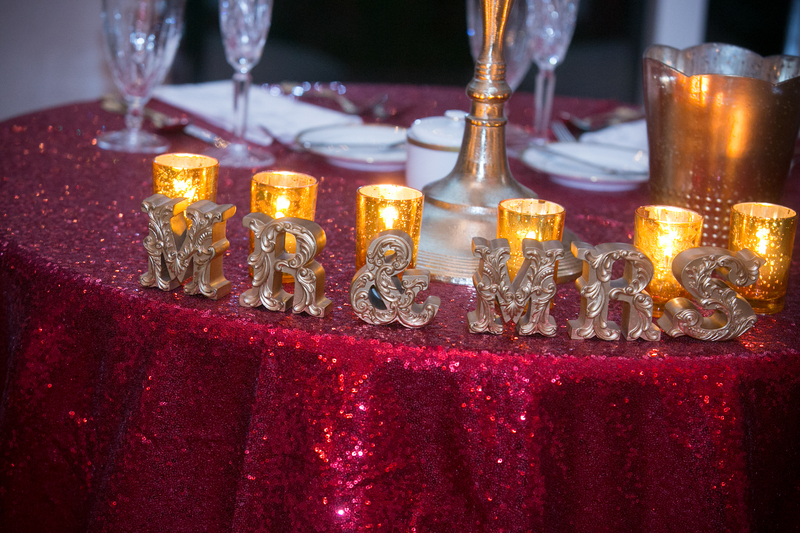 It was a Glamorous reception with Red, Black and Gold flowing everywhere. 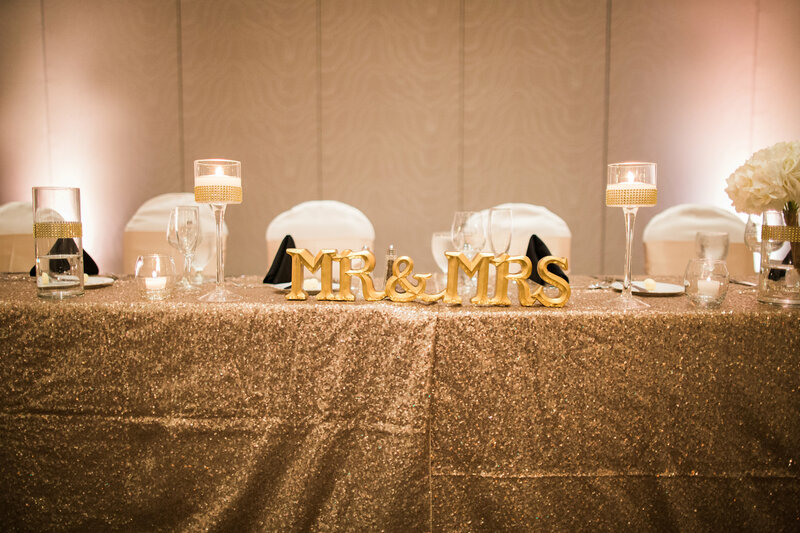 The Mr. and Mrs. table was designed with red sparkling linen, accented with several soft gold candle vases shining with Gold! 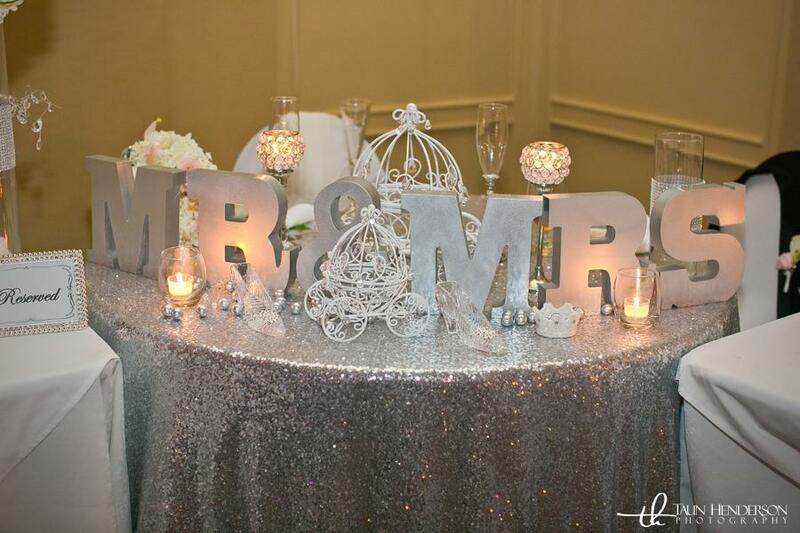 Design House also loves designing spectacular wedding cake tables – – another one of our specialties. 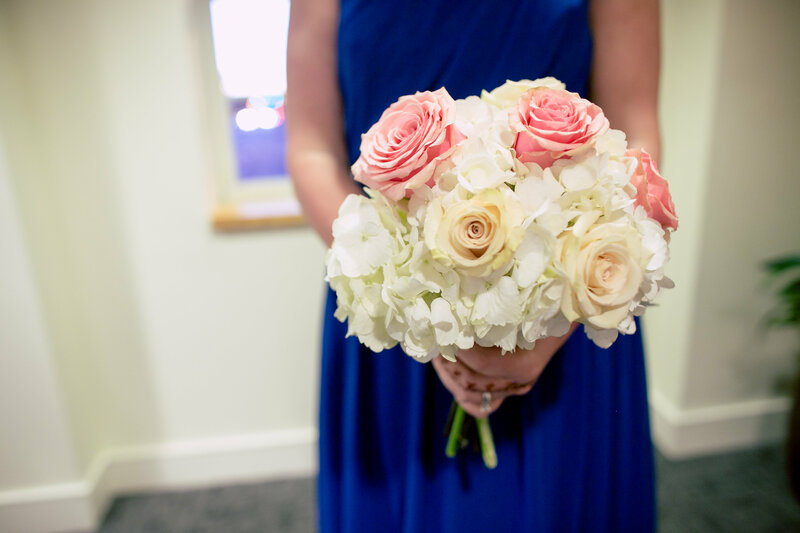 Thank you to Taun Henderson Photography for these beautiful photos. 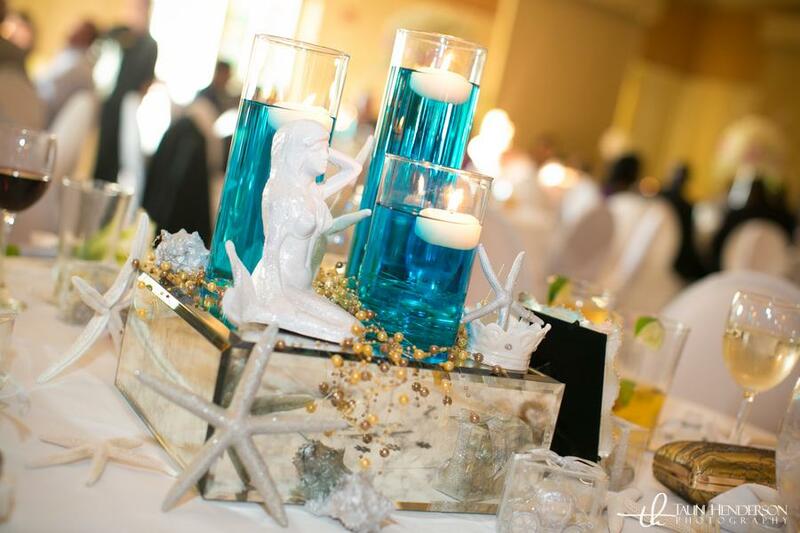 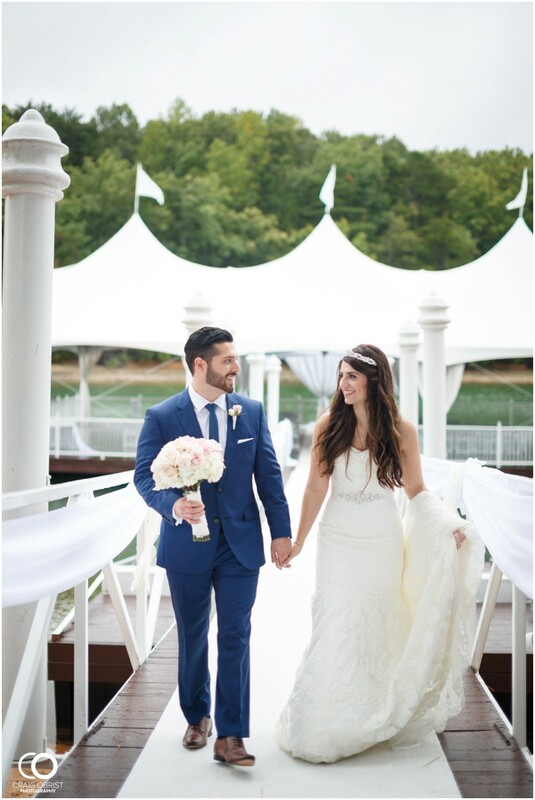 Please join us at the Lake Lanier Islands Spring Wedding Menu Showcase on Sunday, April 10, 1pm – 5pm. 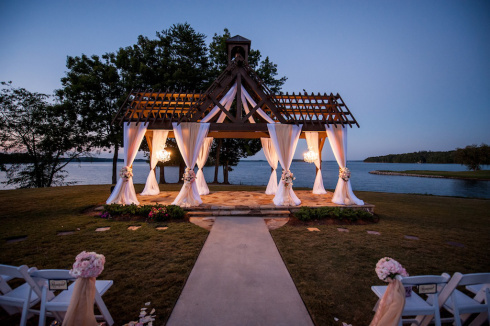 Design House of Flowers, Weddings and Events is honored to be a preferred vendor for Legacy Weddings and we hope you’ll agree that there is no other wedding venue in North Georgia that compares to the stunning views and amazing service of Lake Lanier Islands Resort, Legacy Weddings. 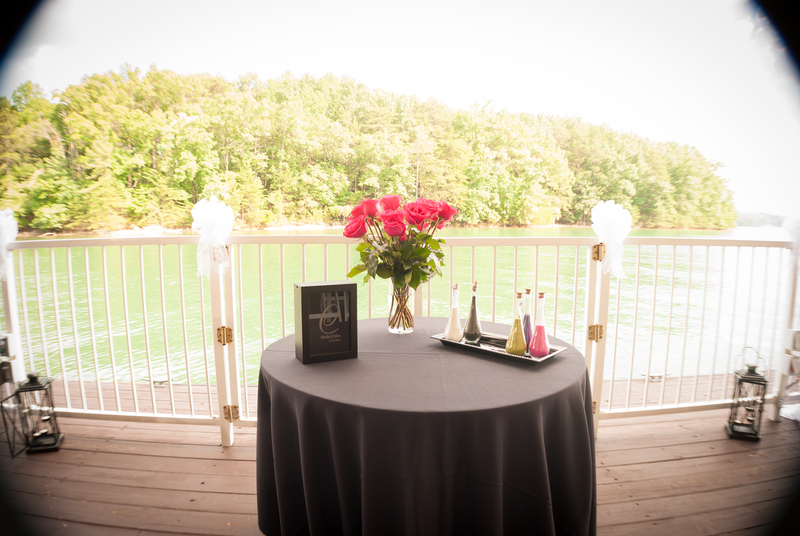 We are excited to collaborate with Legacy Weddings and invite you to Lake Lanier Islands Wedding Menu Showcase! 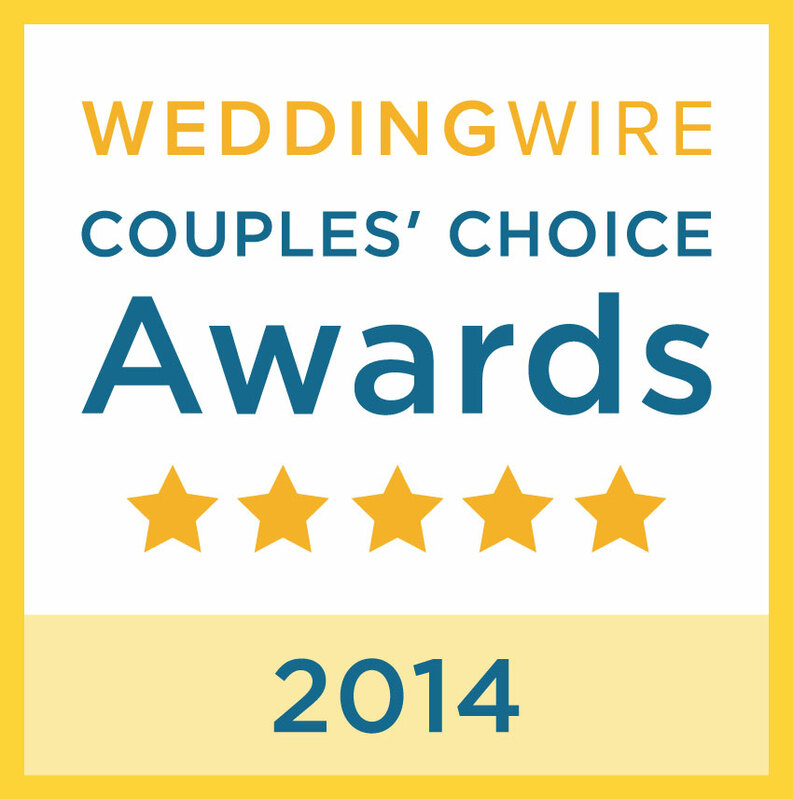 The wedding tasting is an important part of the wedding planning process. 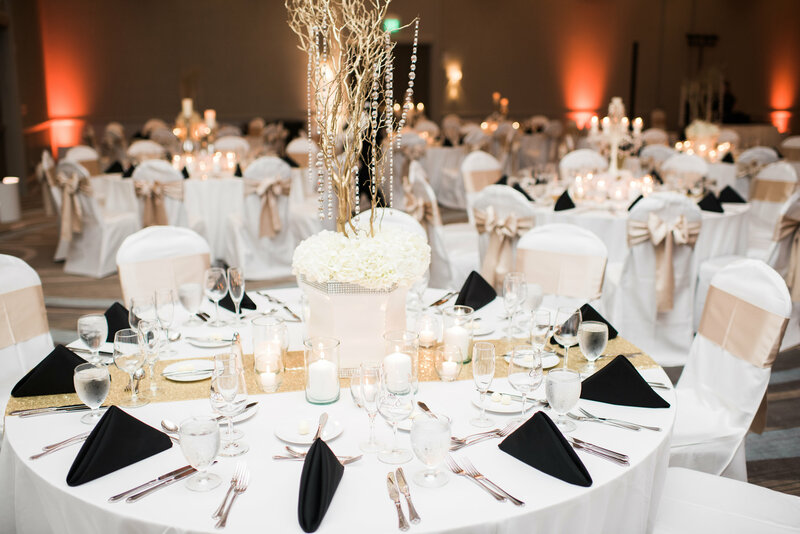 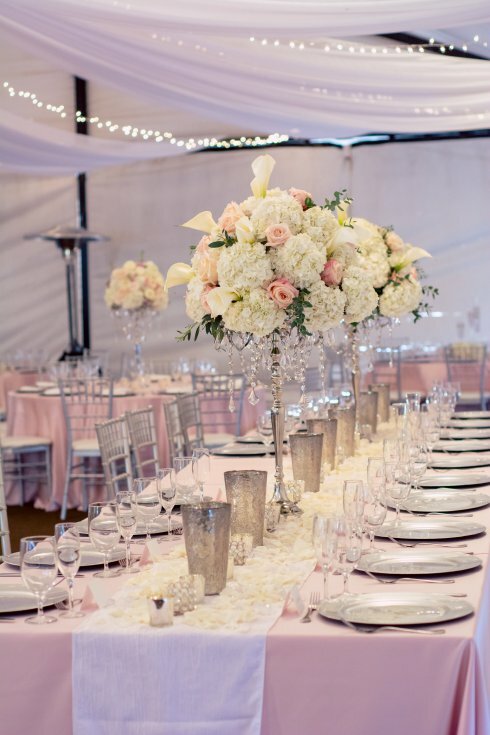 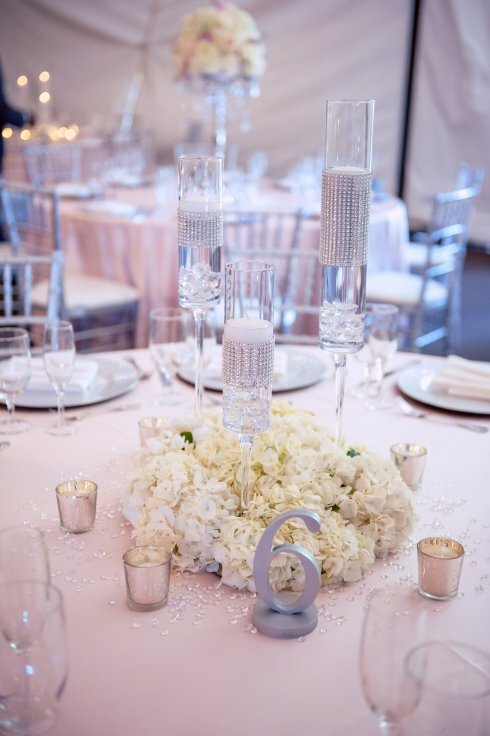 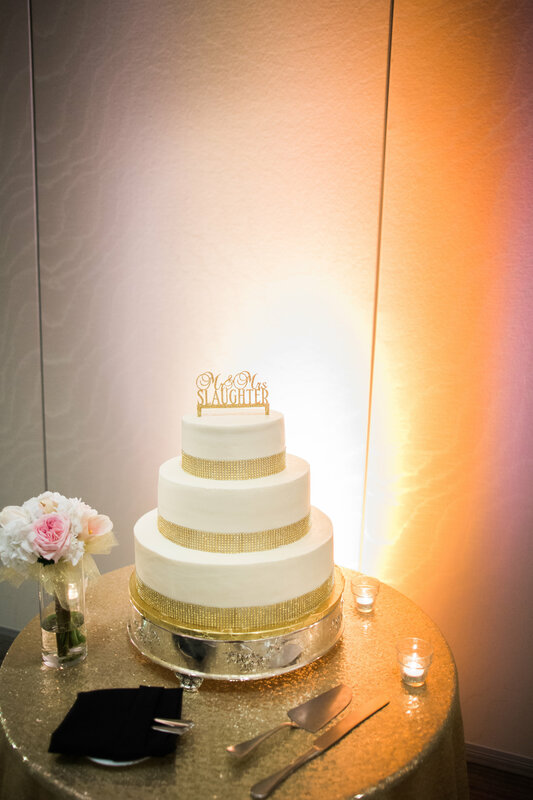 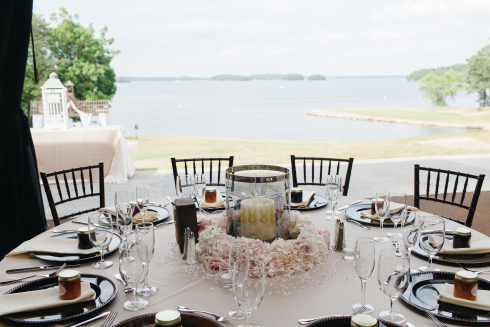 Whether you have already planned your big day at Lanier Islands, or are currently considering this popular destination, we invite you to come and enjoy a delicious array of culinary wedding delights skillfully prepared by our amazing chefs. 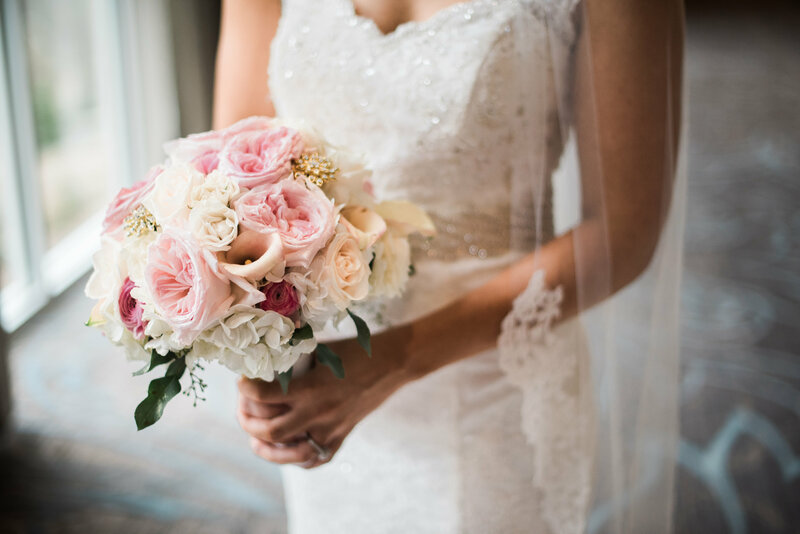 Come see for yourself at this amazing Spring Bridal Showcase at Legacy Lodge and Conference Center offering wedding tastings, vendor mingling, cake cuttings, and Trolley Tours of the Island! 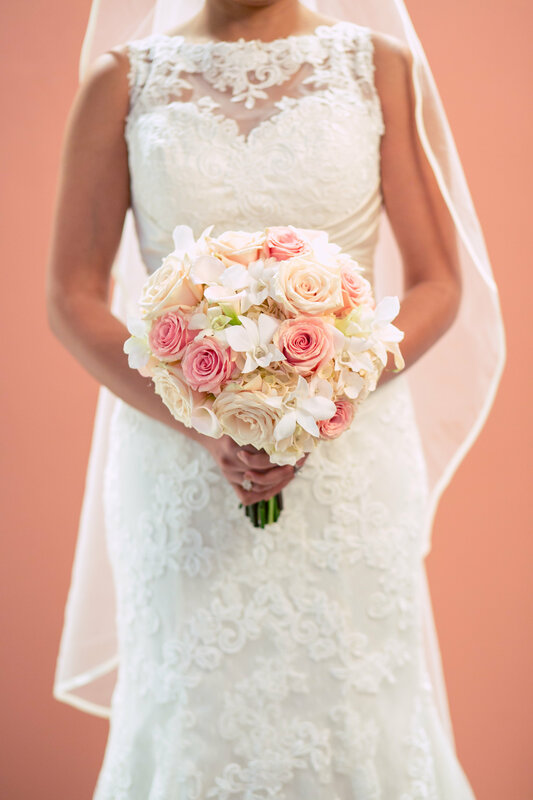 This is The Spring Show of the Season Not to miss! 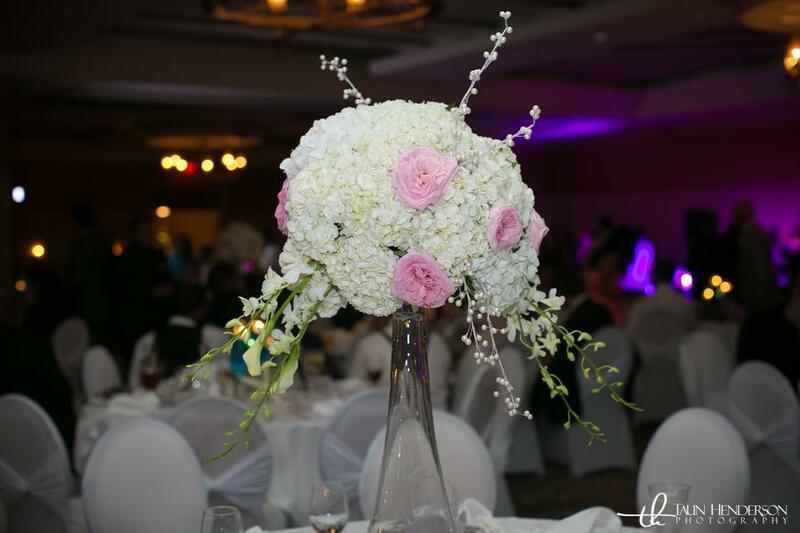 Register Here for this wonderful event! 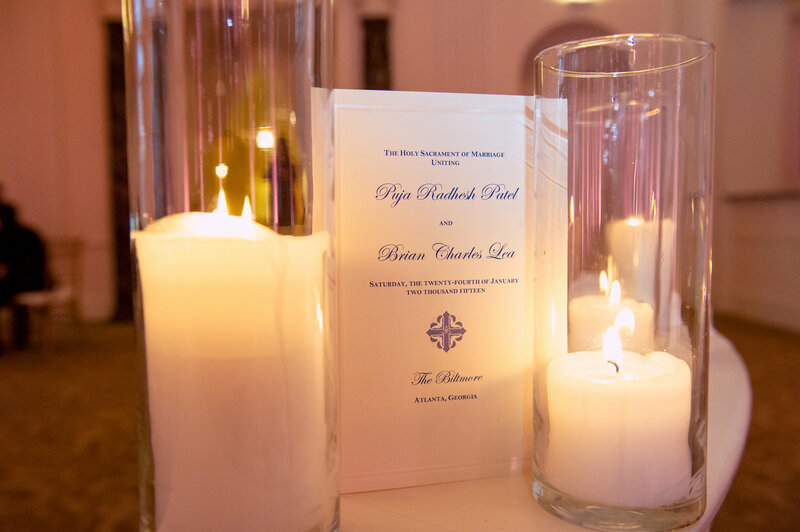 Invitation valid for recipient and up to three guests. 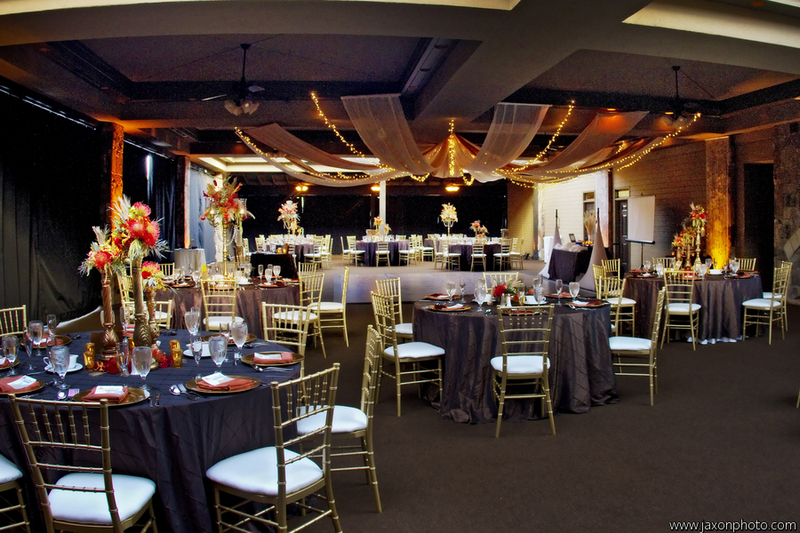 Additional attendees welcome for $50.00 per person. 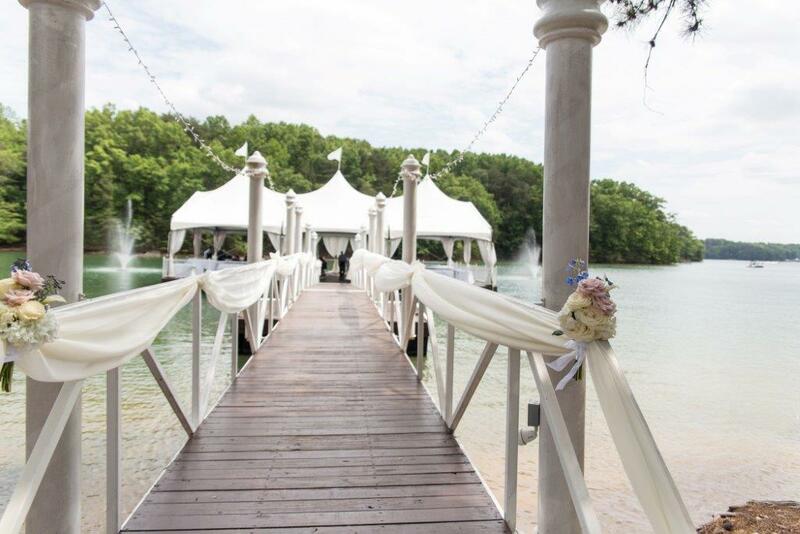 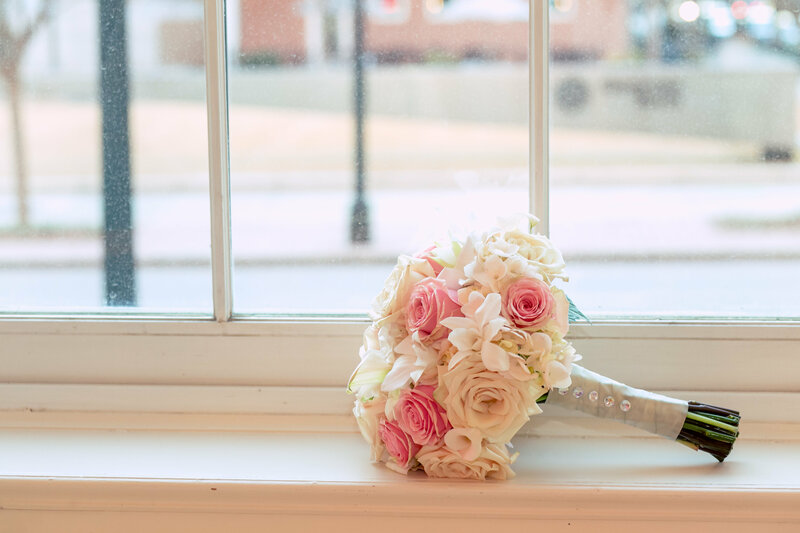 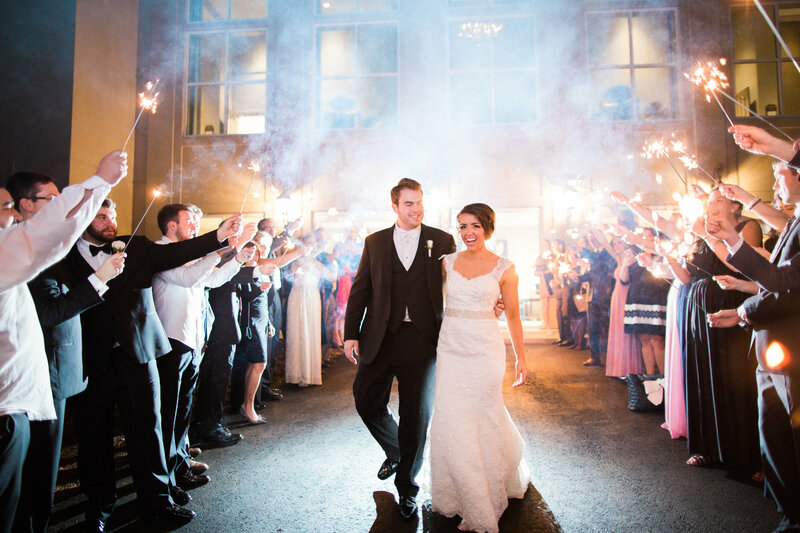 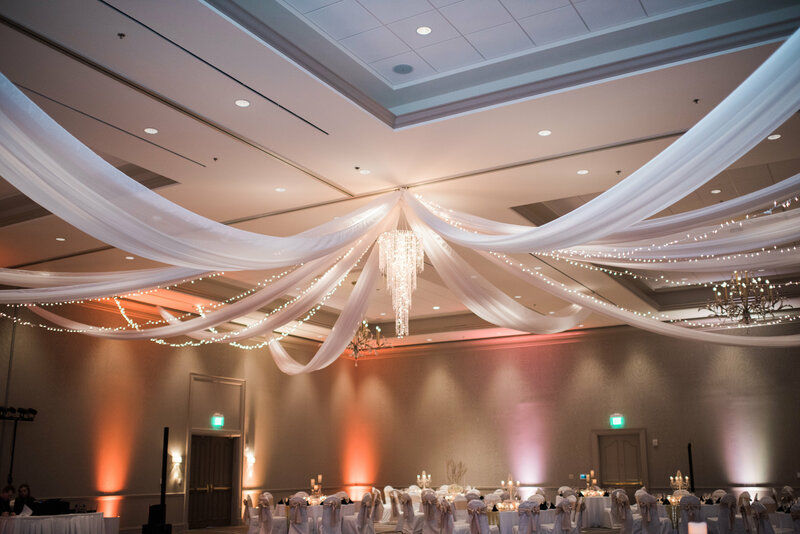 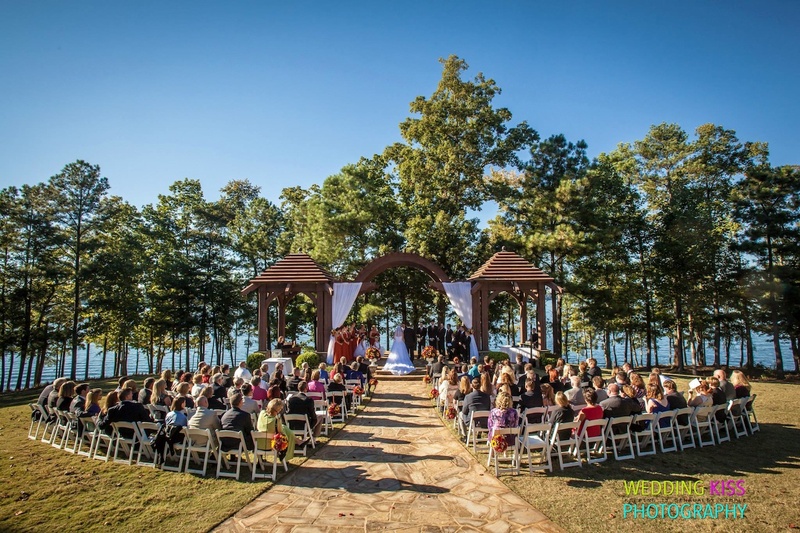 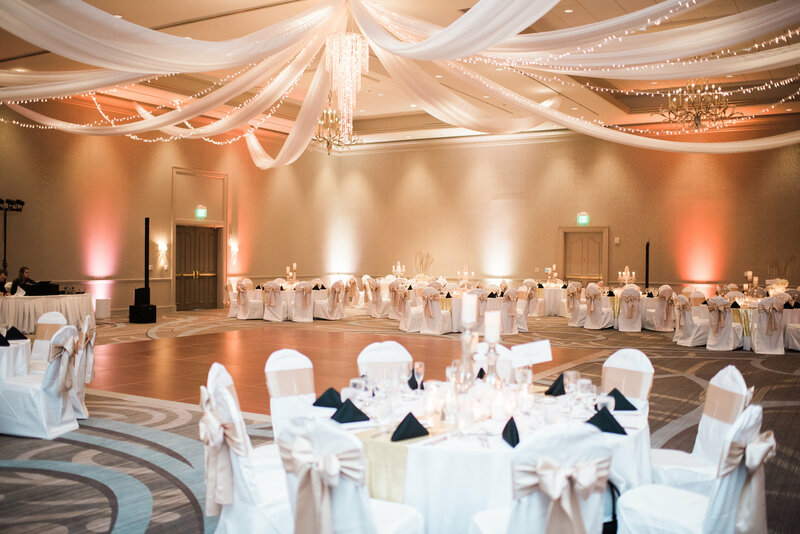 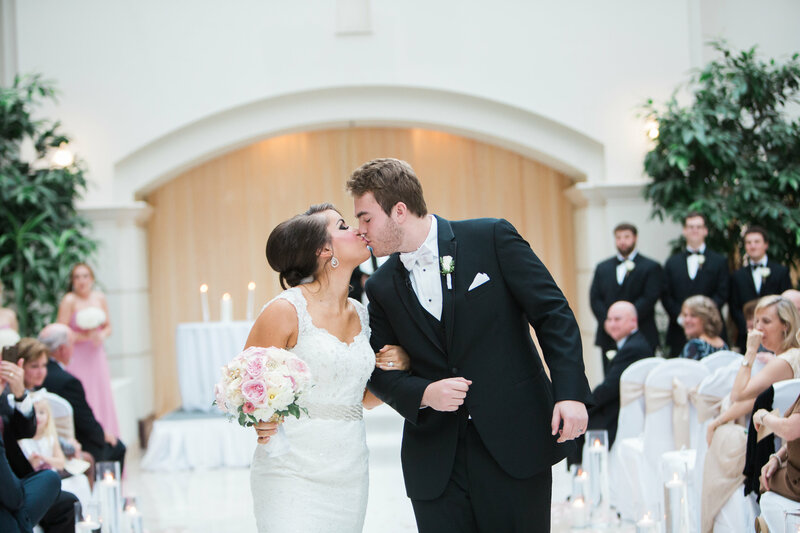 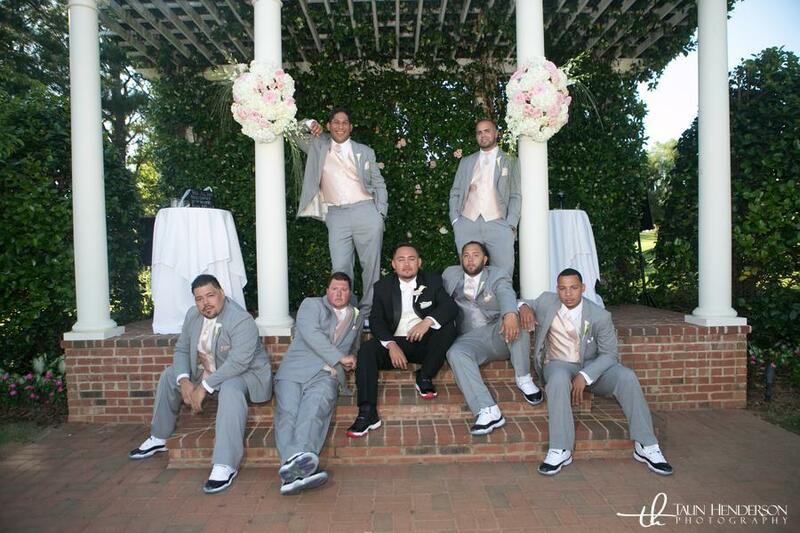 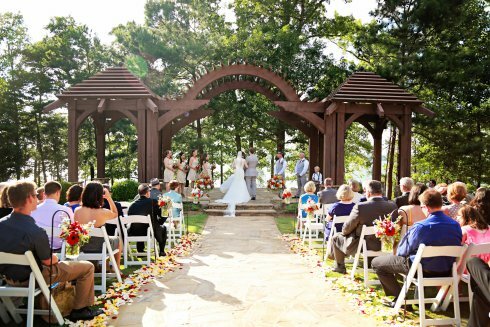 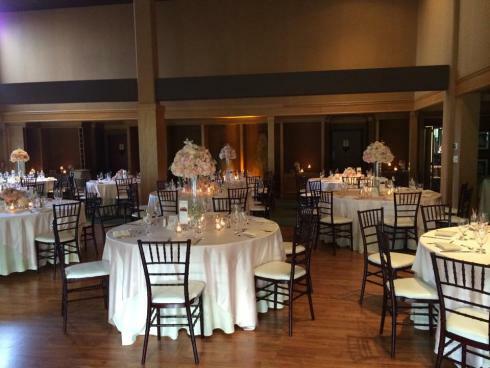 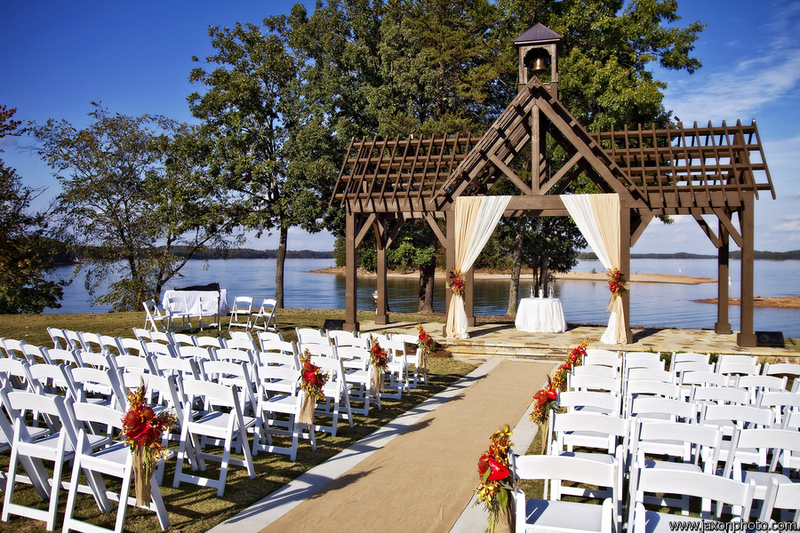 Lake Lanier Islands Resorts offers multiple wedding ceremony & reception locations which allows you to choose the best place for your special day! 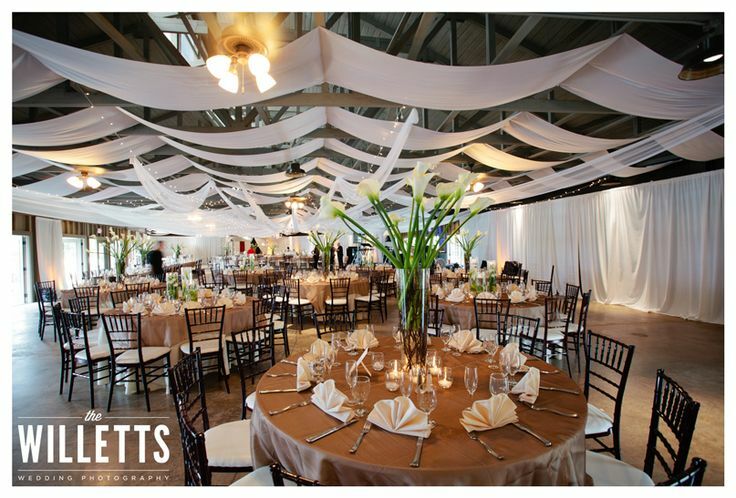 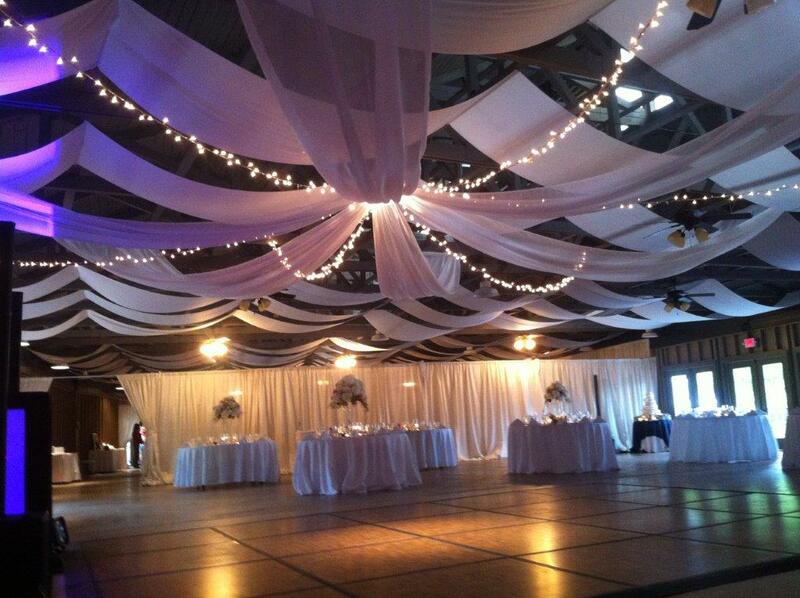 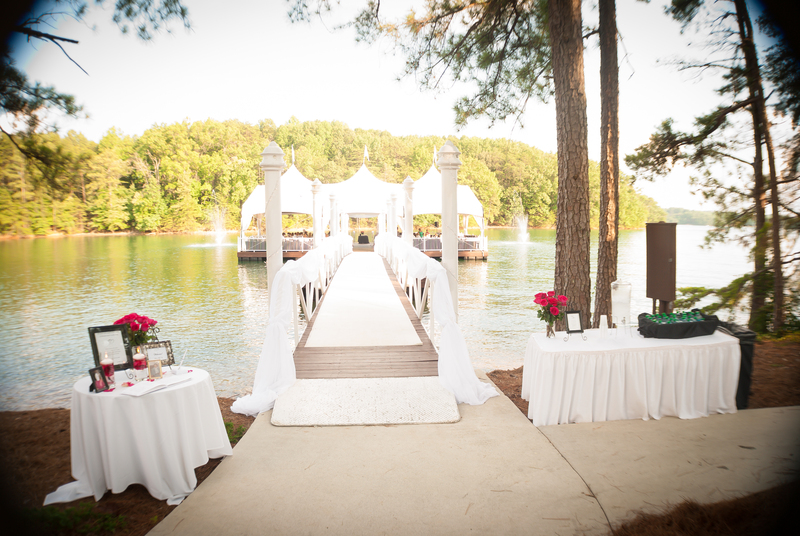 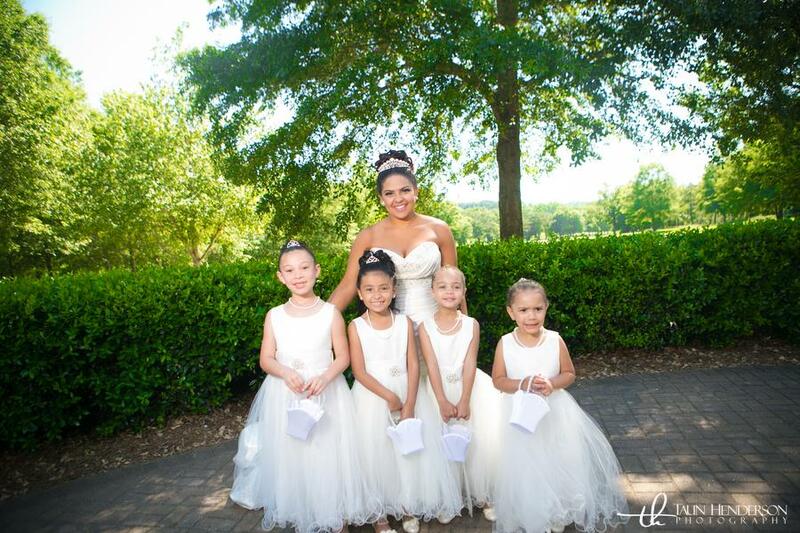 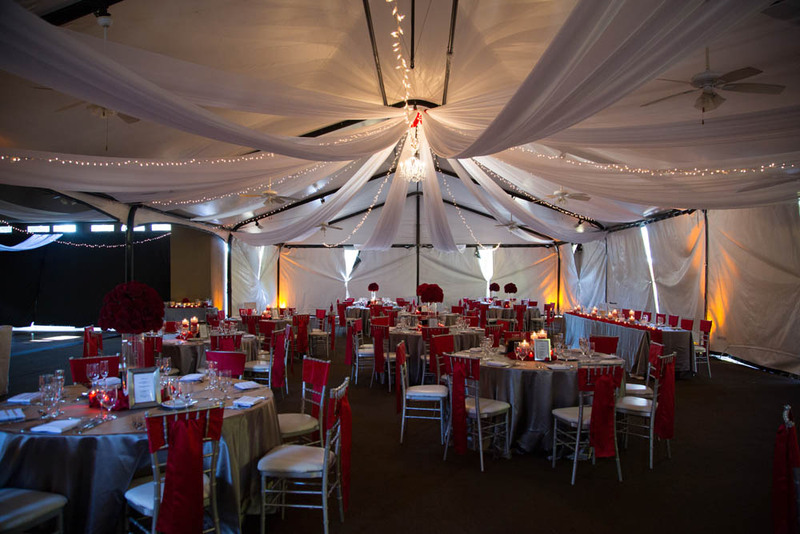 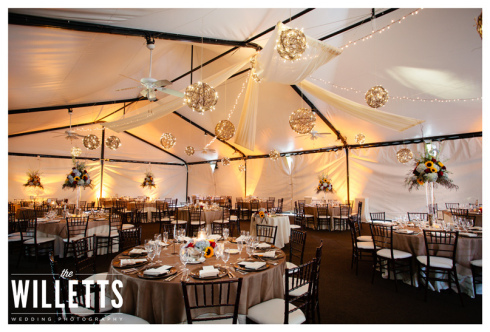 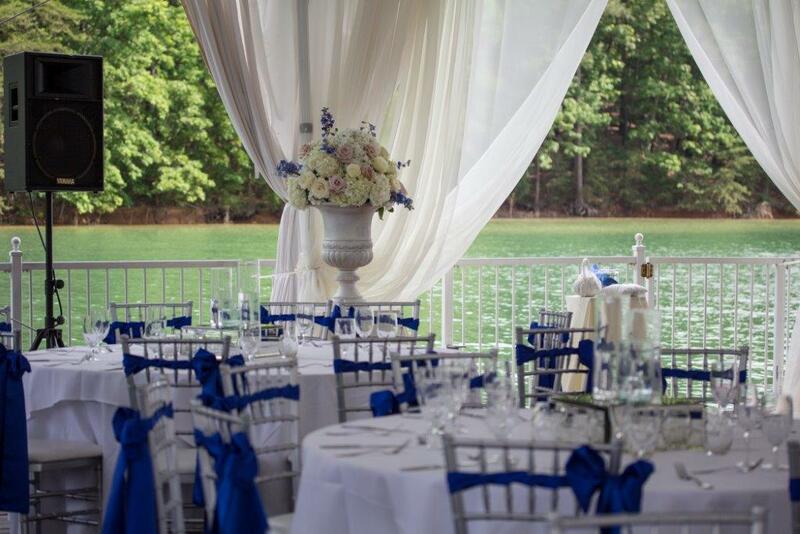 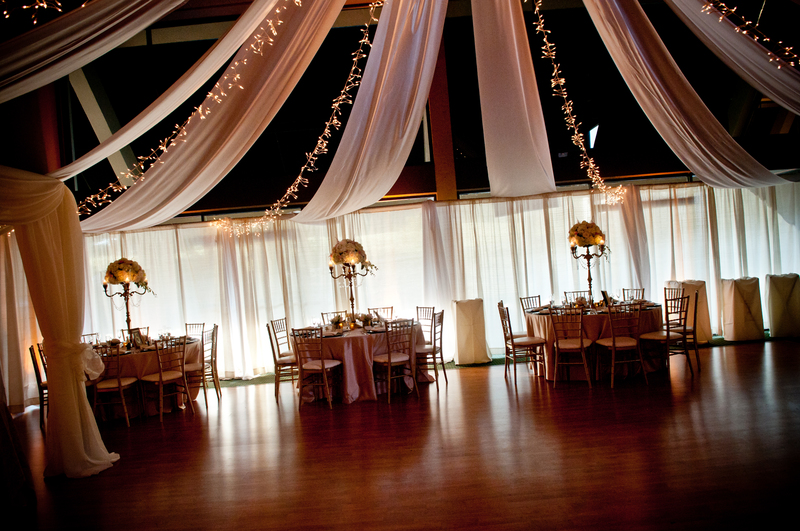 We have included a few photos of our gorgeous Design House Lake Lanier Islands weddings and/or receptions. 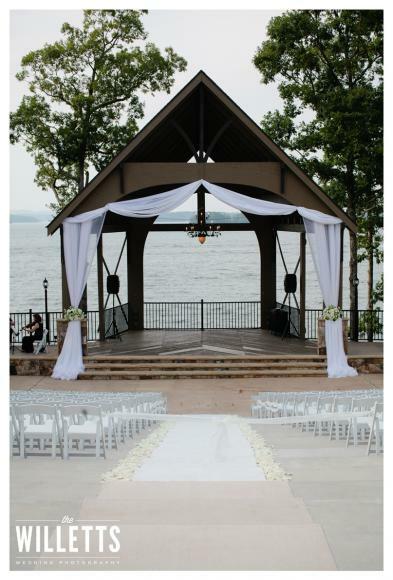 For more details, please contact Rachel Miller at Lake Lanier Islands Resort, at 678-318-2061. 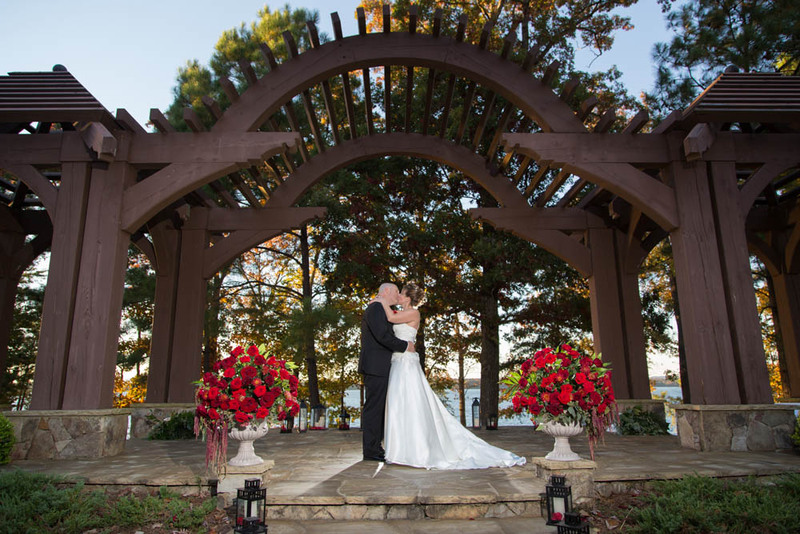 Thank you to all of our wonderful Photographers who have shared these photos with us. 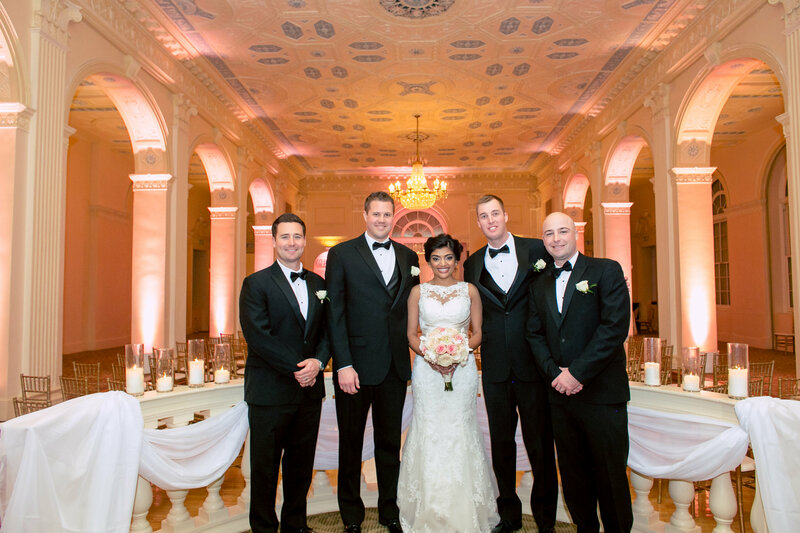 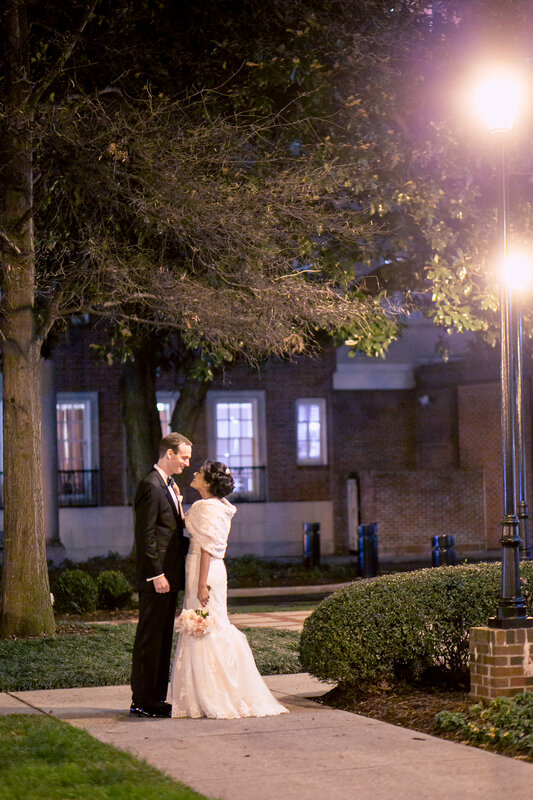 Puja and Brian were married at the beautiful Biltmore, in Atlanta, Georgia. 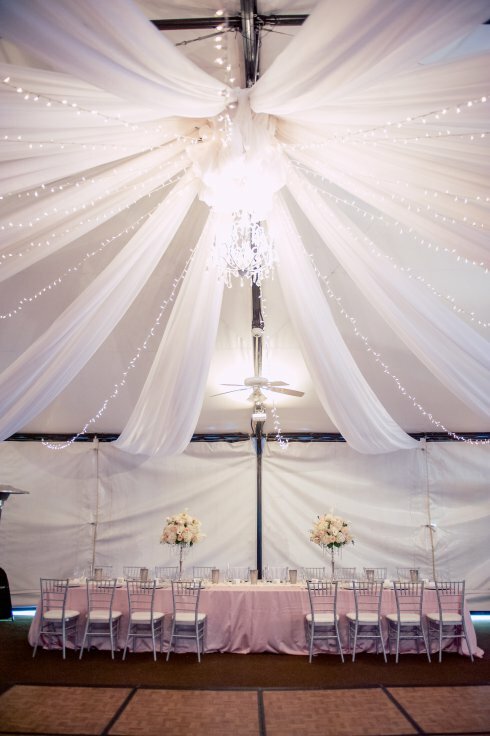 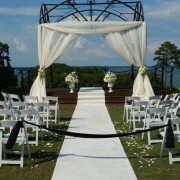 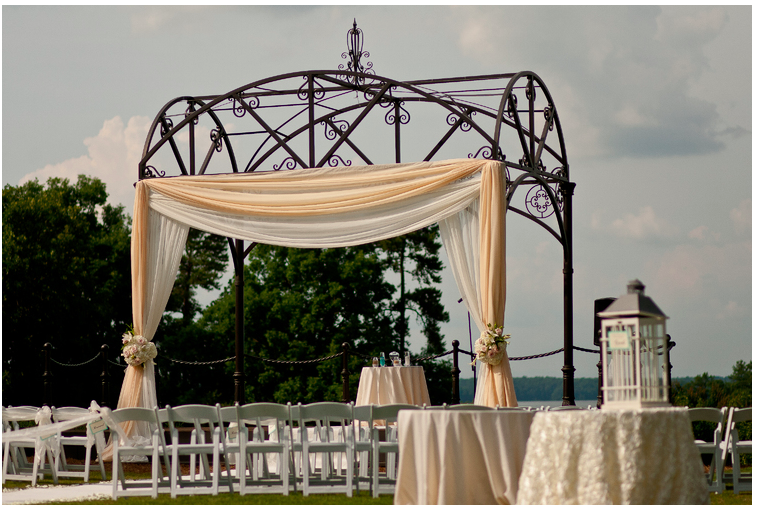 Design House loves designing ceremony altars with drapery fabric and a covered canopy. 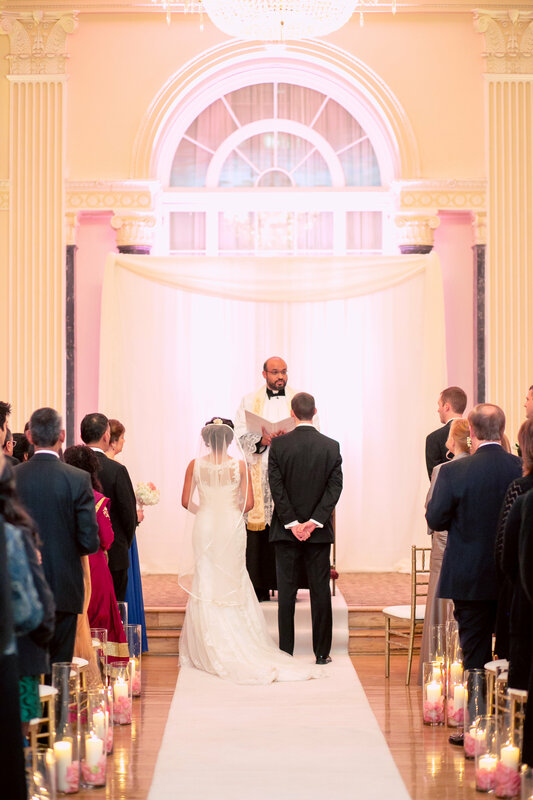 This intimate ceremony was filled with hot pink, & yellows with romantic candles and cherry petals lining the aisles. 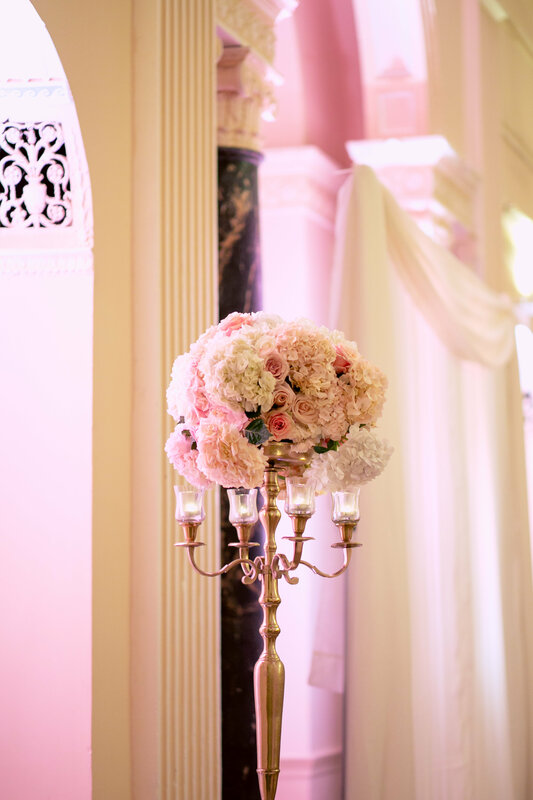 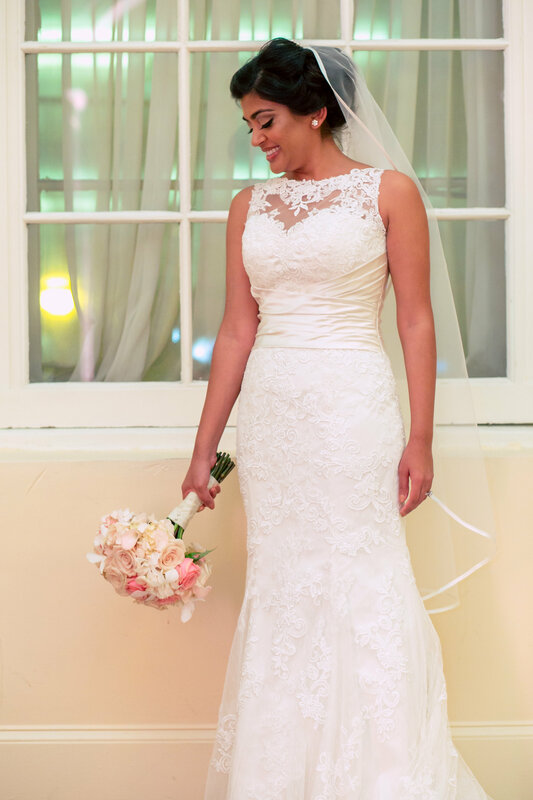 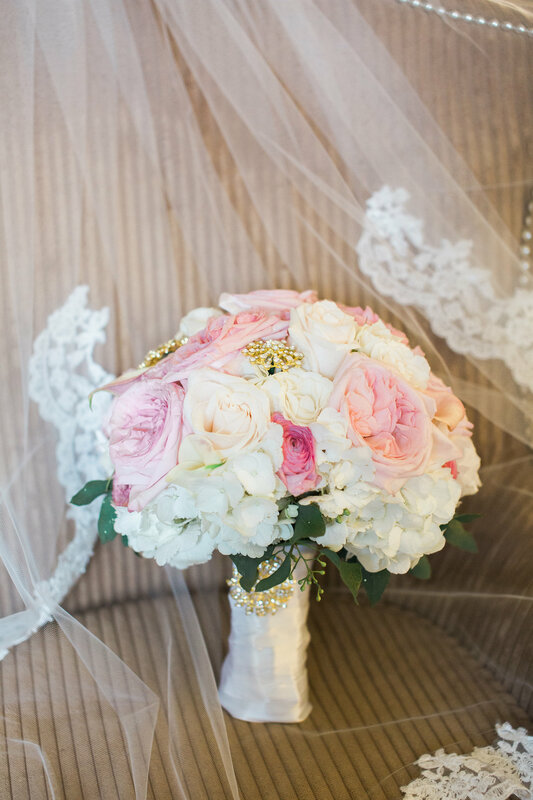 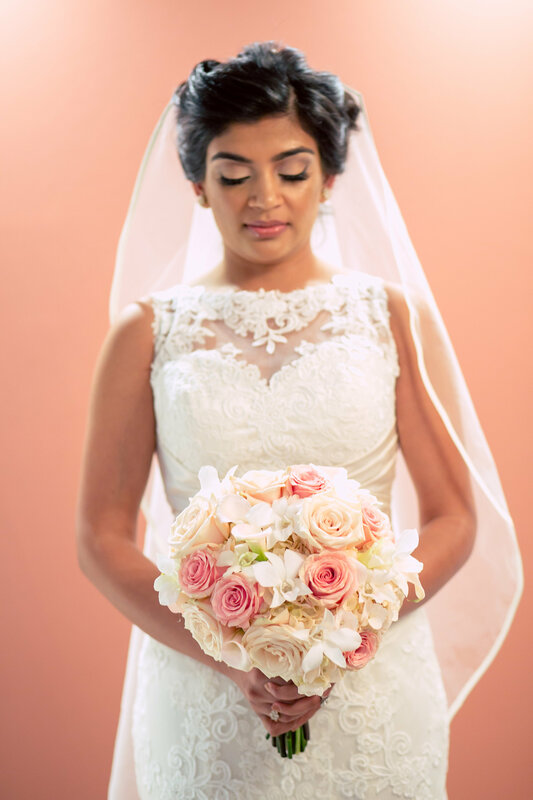 The stunning Puja carried a full elegant floral bouquet designed with pink hydrangeas, pink roses, light pink calla lilies, and ivory orchids. 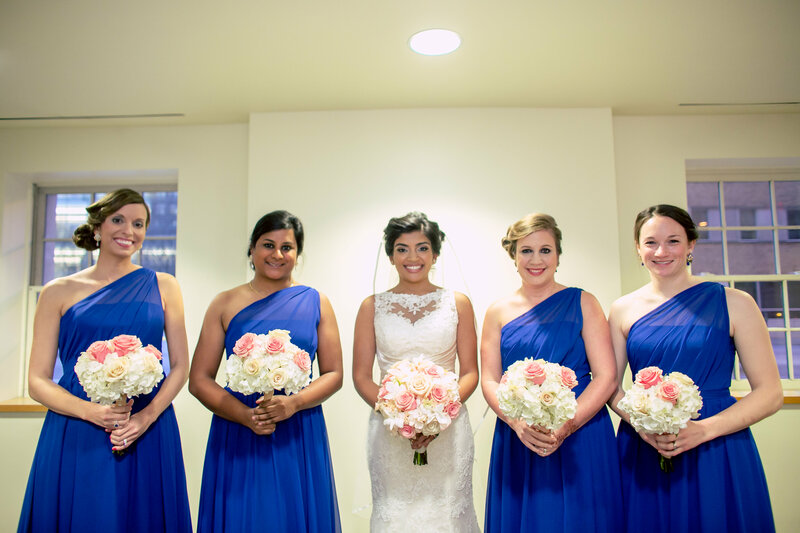 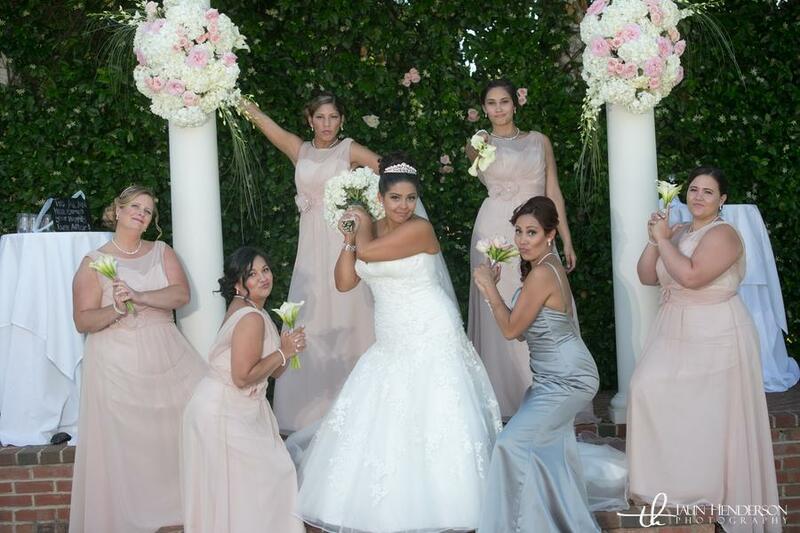 These colors were amazing blended with the mediterranean blue bridesmaid dresses. 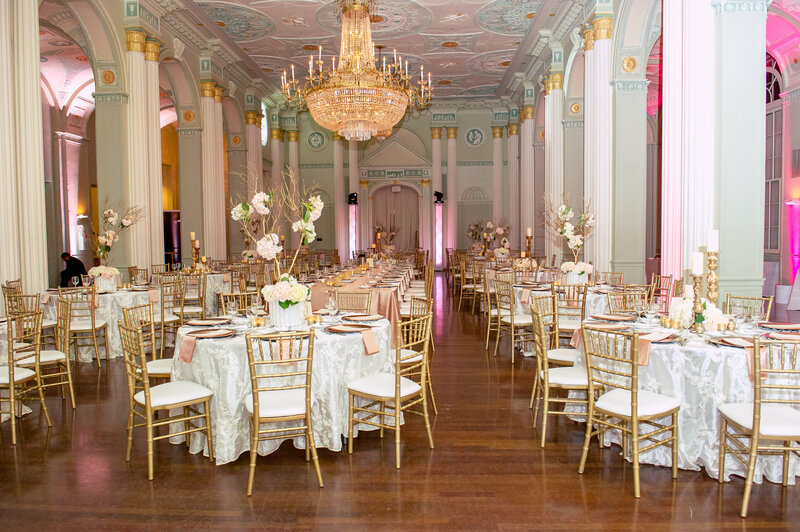 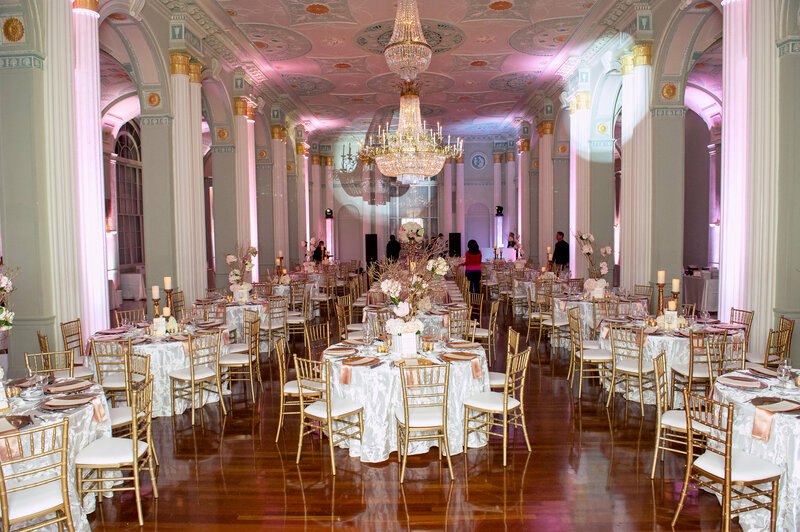 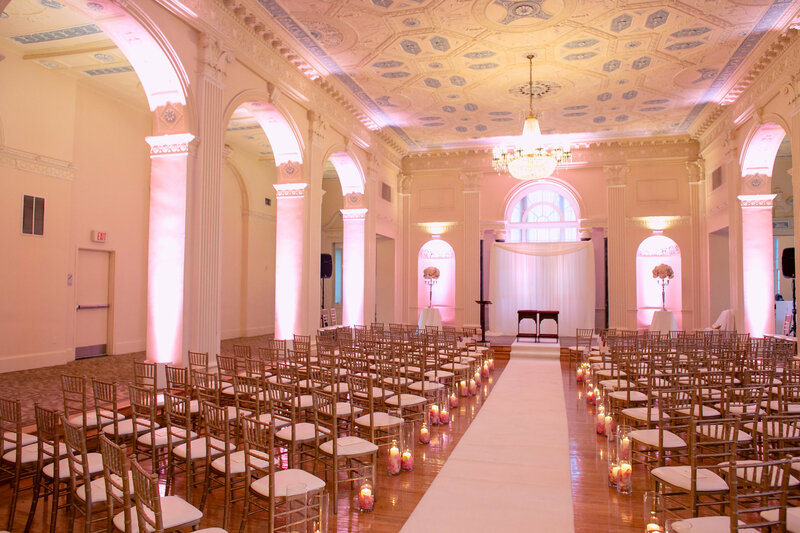 The Biltmore reception ballroom was nothing less than spectacular! 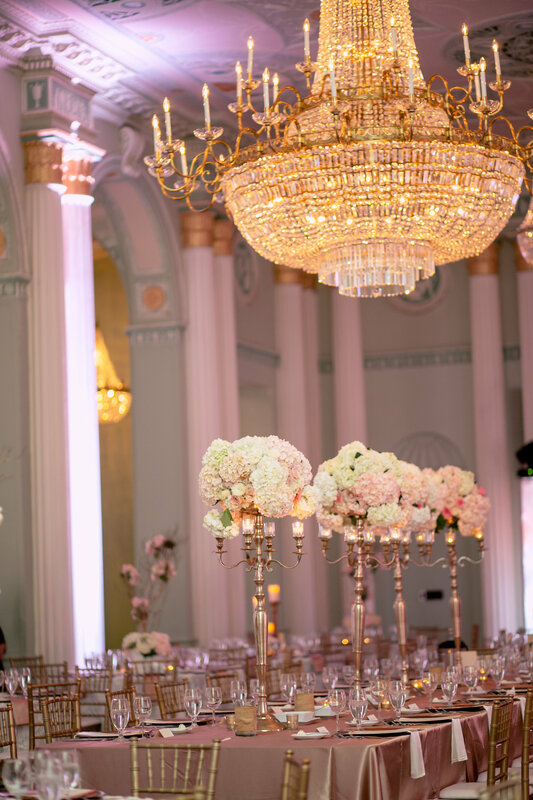 A designer’s paradise venue filled with breathtaking chandeliers as we added gold candelabras and hydrangea tall centerpieces. 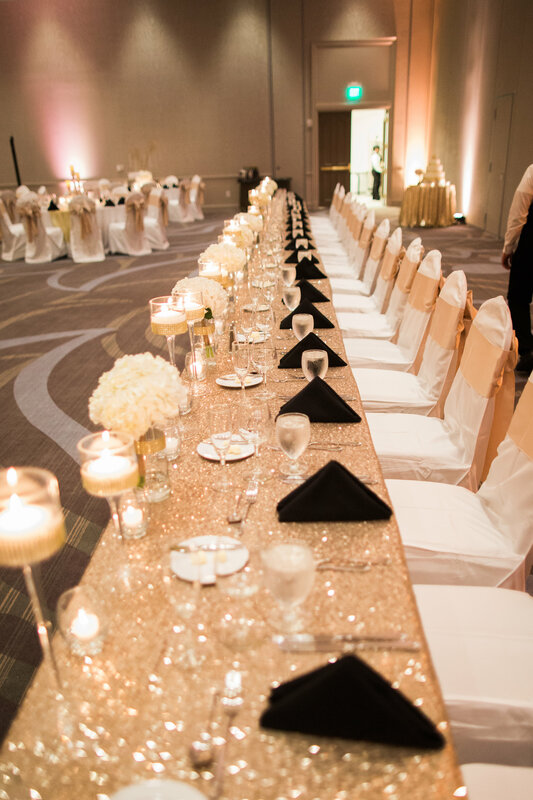 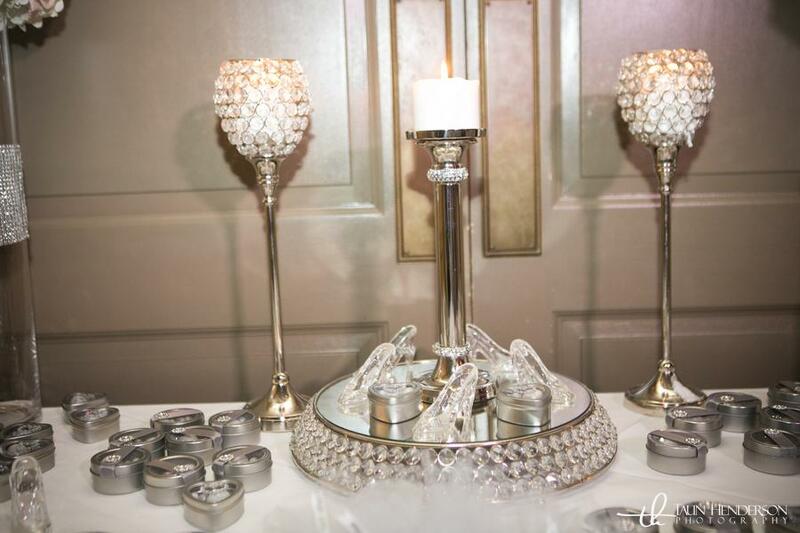 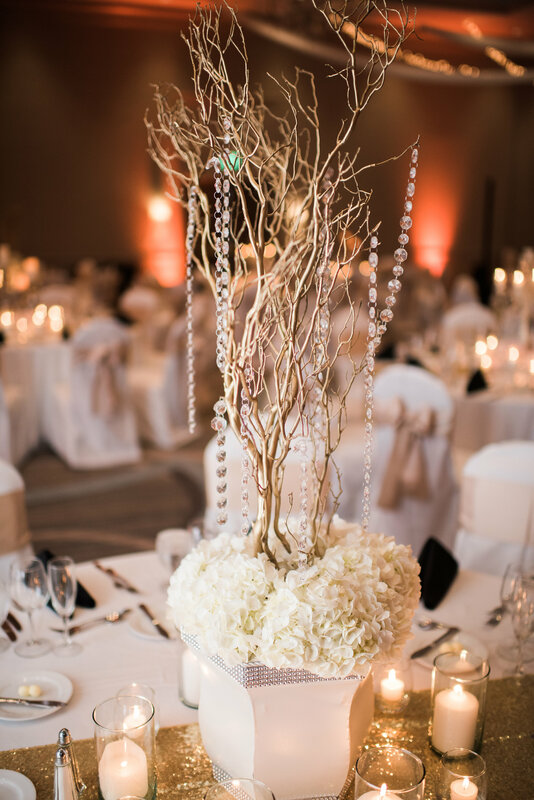 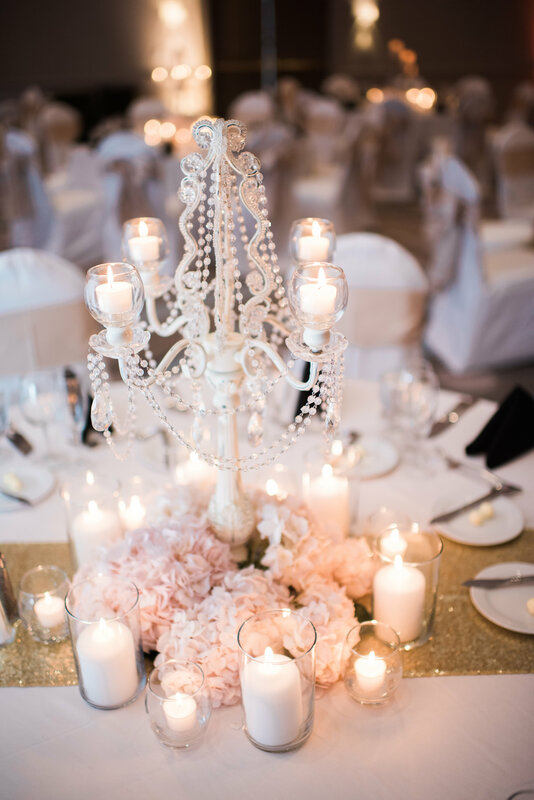 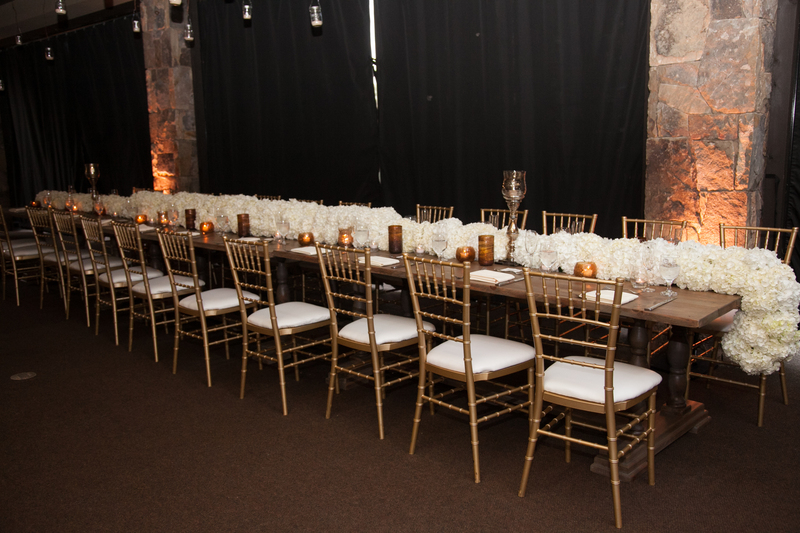 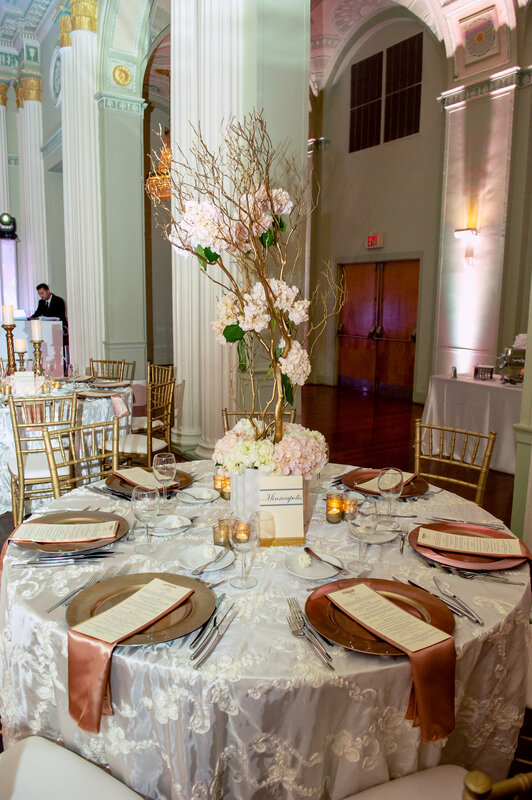 Gold tones and manzanti trees were also part of the elegance along with votive candles on every guest table. 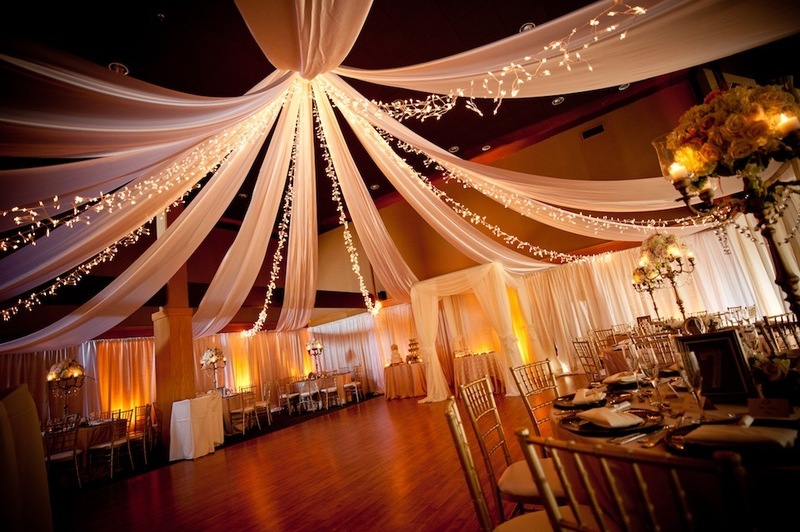 Perfect ambience for this memorable evening! 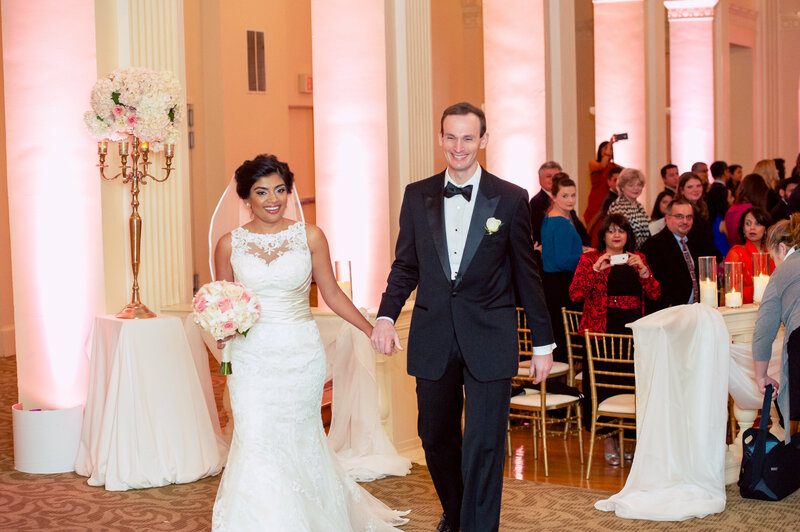 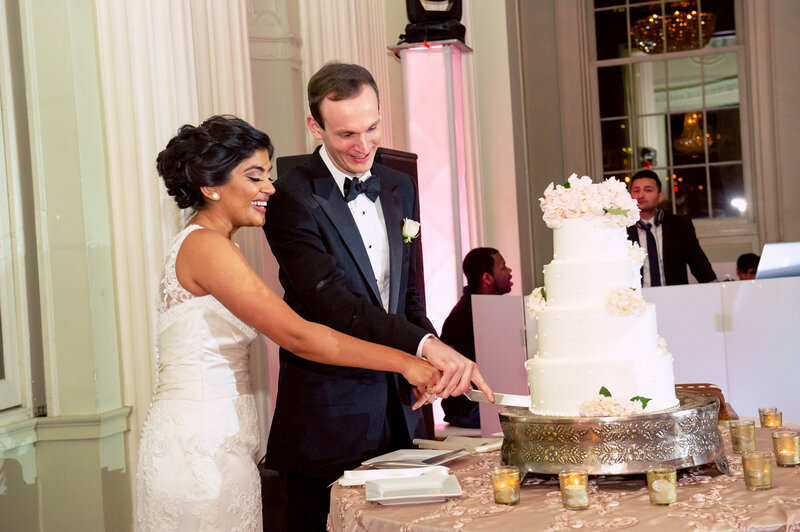 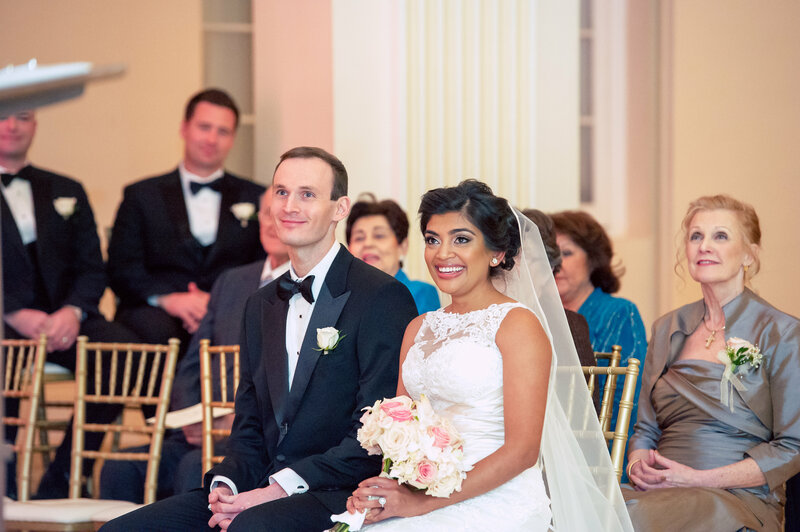 We are so very happy for Puja and Brian. 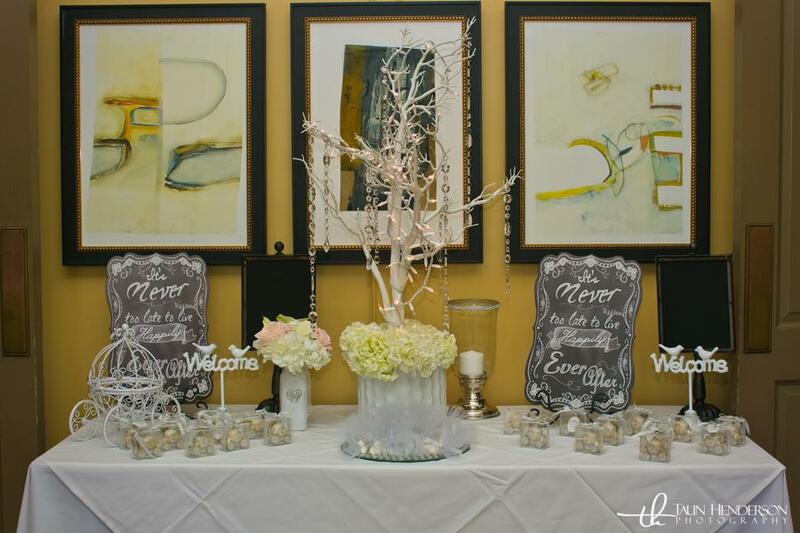 Thank you to Once Like a Spark Photography for these wonderful photos.